Designing a hotel oriented towards Millennials, or Generation Y, means addressing the revolutionary shift in society's "gestalt" created by the instant accessibility of information. 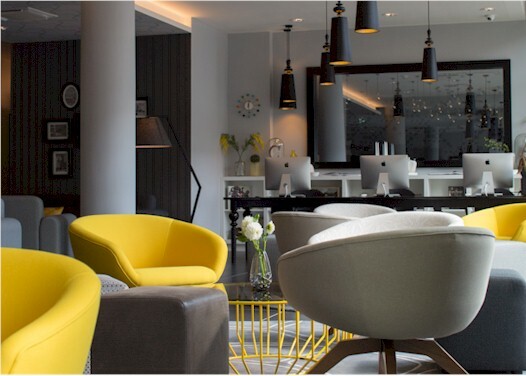 Although people of all ages are participating in this transformation, those born in the last two decades of the 20th century are shaping how these changes materialise through their attitudes towards the accessibility of technology, sense of community, work / life balance, experiences vs. possessions, memory-making, and personalised service – all of which impact a hotel's interior design. As digital natives who are intrinsically comfortable with technology, Millennials expect their hotels to have a design that is seamlessly compatible with the flexible lifestyle made possible by their devices. Generation Y has been the driving force behind the blurring of boundaries between work and free time, placing greater value upon the "living" aspect of the work/life balance since they can work anywhere using technologies developed as they grew-up, for example the smartphone, tablet and laptop. Our job as designers is to create spaces that enable adaptability and customisation so that more personalised service can be delivered with the ability to work at any time of day. So the scene has been set for combining work, meeting, eating, and relaxation activities within hotel lobbies, with the preference today for loosely defined, open plan areas. Fitted with plenty of charging points and flexible seating arrangements, the setting can be suitable for casual business meetings, reading a Kindle book, and coffee or lunch either solo or with friends. But instead of working from a comfortable sofa or big communal tables where you can meet others, some guests prefer sitting on the bed in their guestroom with their tablet – it makes one wonder if desks are even still required. This was done with the flexible layout of the Hotel Reichshof Hamburg, the first and benchmark property for Curio - A Collection by Hilton in Europe. The hallmark of this new brand, a curation of uniquely storied hotels that provide travellers who have a passion for discovery with a taste of the authentic flavour of communities, syncs perfectly with the values of the Millennial generation. Feeling connected to the local culture is highly valued amongst this demographic; this trait can be implemented within a hotel in a number of ways.